The Library periodically runs workshops for researchers on a range of topics, including Google for Researchers. When you perform your next search an Import to EndNote link will appear under each item. 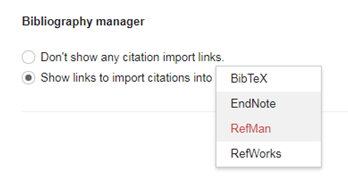 Note that you can only export one item at a time to EndNote, and check the details carefully, Google Scholar citations may be of poor quality. If using Mendeley, install the free Mendeley Web Importer to scrape multiple references from the page in one step. For further information, see the Mendeley Survival Guide. Access advanced search from the menu in the top left. It gives many options for refining your search. Alerts are a great way to keep up to date in your field of research or study. Once you have done your search, look for the Alerts link on the left side of your results to set it up. A Google Scholar profile is free and will appear at the top of the results lists when someone enters your name into Google Scholar, therefore promoting your work. Set one up by clicking on the My Profile link on the Google Scholar homepage. It can be particularly useful for establishing an overview of a topic, or for searching for a multidisciplinary topic. Many of these items can be difficult to source using subscription library databases. Most importantly, the lack of control over your search. Unlike other databases, there is no ability to combine searches, use subject headings and only limited ability to sort and refine search results.